The particularly tricky part is that the plants will often let you believe that they’ll stay nice and manageable in height. Even by the 4th week of vegetative growth, they may remain squat and bushy, reaching only a foot-and-a-half in height (taller is possible under higher wattage lamps). Then, when flowering begins, they start reaching for the sky – they’ll surge up a couple of inches overnight, and continue stretching as they flower and buds form. By that point, it’s too late to trim without seriously sacrificing harvest yield. They key is to plan ahead. Top your plants (again, only the non-autoflowering varieties!) while they still have 1-2 weeks to grow in the vegetative phase. This will give the plants time to recover from the minor trauma of “topping” and extend axillary buds from lower nodes of the plant up towards the light. During flowering, these new “stems” will both (the plant will usually respond to topping by extending two lower buds) become flower-, and later, calyx-coated masterpieces of marijuana growing glory. First, look for the terminal bud of the plant. Please don’t confuse the term “bud”, which in plant anatomy refers to a an actively leaf-growing appendage of the plant with the slang term “bud” for the mature flower pods (calyxes) of the marijuana plant. Looking for the terminal bud (aka “shoot tip” or “apical bud”). Don’t be afraid to gently pull downward on the leaves at the top of the plant – they will not break too easily. When you have found the terminal bud, you should trim it cleanly using a small set of shears (I prefer nail scissors for smaller plants, such as those in this 100 Watt grow). Better to trim twice than trim too much and cut into the stem – so have a close look and be cautious. 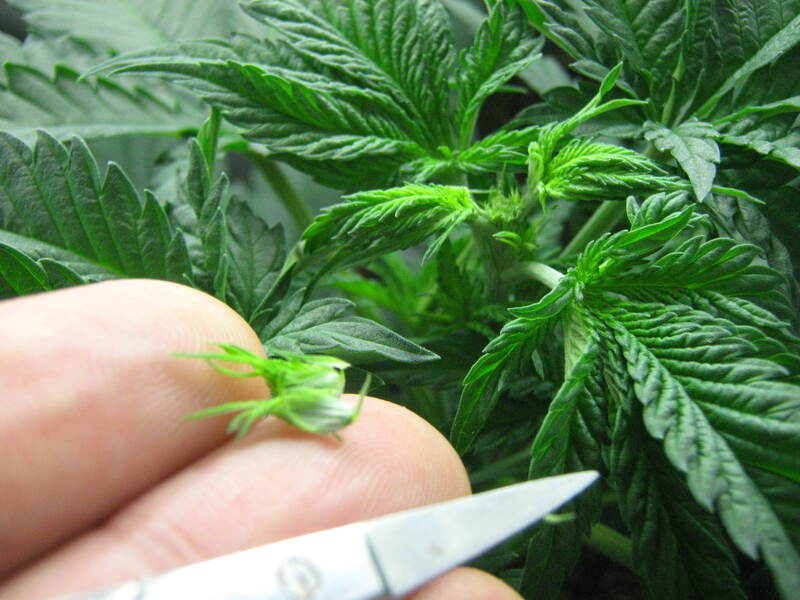 Trimming the top of the terminal bud without cutting into the stem below. To alleviate your fears, I should note that even if you were to lop off the top of your plant with garden shears, it will more than likely make a full recovery – cannabis plants are famously resilient. I’ve revived the stump of a failed grafting experiment to full growth and harvested several ounces of perfect buds from the final plant. The only thing you will lose is time – a harder pruning means that the plant will first need to gather resources and produce more of those all-important light-gathering vegetative leaves at the top of the plant. A note about topping plants, and what you can expect: The most wily of sativa plants may indeed require a second top trim to keep them withing vertical confines of a small grow room. Some growers refer to continued topping during vegetative growth as a “screen of green” (discussed in our ebook), where you additionally support the many vertical stems with a metal screen or series of wires. You can trim and continue to vegetate your plants to your heart’s content – they won’t flower until you switch the light schedule (again, autoflowering varieties excluded). You can also expect to harvest more great-looking “colas” (Spanish for “tails”) of finished marijuana flower buds from topped plants. You may even increase your final yield this way – light exposure tends to be more even this way when using overhead lights. The devil is in the details when it comes to successfully growing your own marijuana. Avoid pests, heat- and nutrient-burn, overwatering, root problems, and all the strength-sapping problems that can occur along the way, and you’ll have your own top-shelf medical marijuana growing in the privacy of your home. Grow organic quality, with fine aromas, and the assurance that you had a hand in production from start to finish – check out the links below for our ebook “How To Grow Cannabis At Home: A Guide To Indoor Medical Marijuana”. [Author and Medical Marijuana Grower Glenn Panik’s “How To Grow Cannabis At Home: A Guide To Indoor Medical Marijuana Growing”, is available on iTunes (iBooks) here on the Amazon Kindle, and also available as a ‘stealth title’ for the Kindle here. Protect your privacy! Cool article. Let me add that marijuana is trimmed to maximize on the yields and also production. 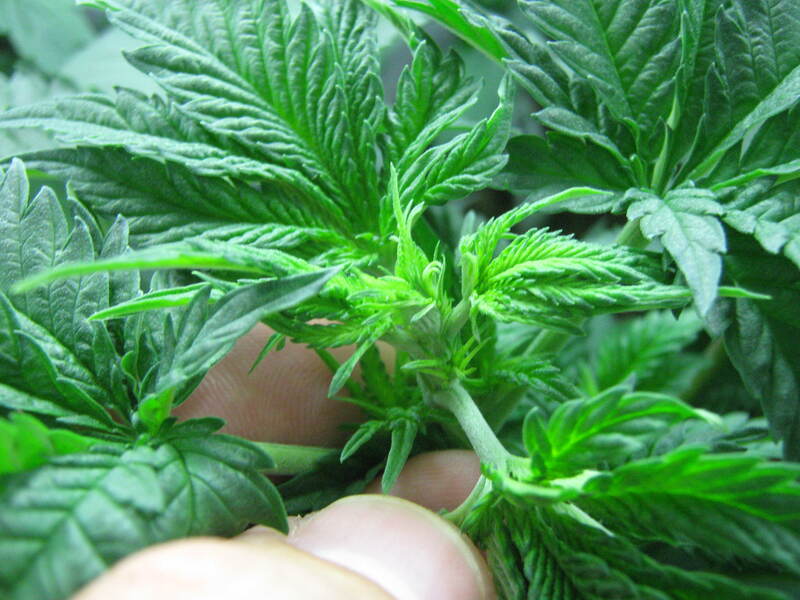 When you trim your marijuana plant, you allow it to get enough “food” for its size and branches. The best trimmed marijuana plants are usually very healthy and will leave you with bumper harvest. Additionally, when you trim your plant you will also keep pests and any forms of infestation away. But that’s not all. For your marijuana plant to be extremely healthy you must make sure that that the room you are planting them is airtight and has a humidity of about 60%. i have grew marijuana plants all trough out my life and aint never got them to bud within the fourth set of leaves .people say their are 90 day seeds that will caues a plant to bud within 90 days but i couldnt never get them to bud .Any advise? I have a ghost train Haze planted in the garden. It is about 8 weeks old. Planted first week of June and the plant is already 8 ft tall. What can I do to stop it from getting to 12 ft without hurting the plant.